The main concern at Toyota is our client's satisfaction and the overall product quality we provide. Toyota stands behind the saying "total customer satisfaction" and it drives everything we do. The best approach to maintaining satisfied customers is to offer them with the best quality products and service. Frequently utilized at all Toyota facilities is the concept of "kaizem" which is a word that literally means "continuous improvement." Toyota's dedication to excellence is a key factor in their philosophy. Kaizen has been incorporated into the Toyota Production System. It drives our engineering and production teams in order to always enhance our service personnel, and our forklifts. Toyota has been a leading supplier of innovative lift trucks for over 4 decades. Currently, we have sold over 1 million lift trucks to thousands of happy customers in more than 200 countries all around the world. In each stage of our operation, there is a continual improvement and complete devotion to yielding safer machines and more efficient material handling products. Toyota is really dedicated to offering our clients exceptional performance, durability and equipment which will perform in even the most challenging environments. Because one out of each five lift trucks sold in the world is a Toyota, statistics prove that Toyota's dedication to both performance and customer service has led us to amazing accomplishments. 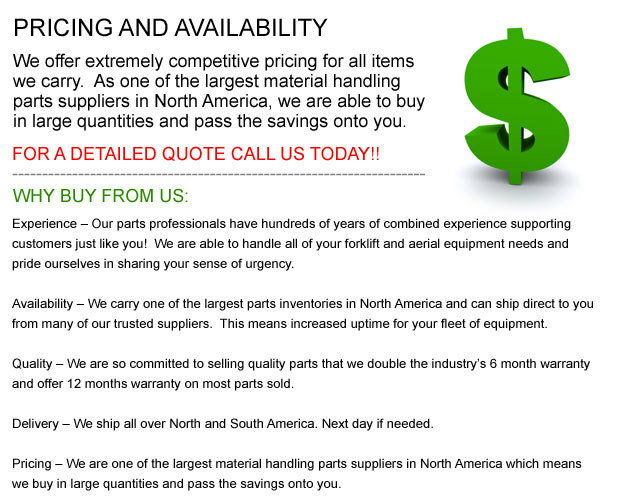 We are one of the premier companies in the material handling sphere. Toyota has implemented a fantastic quality control system that would guarantee that the same tolerances as the part it replaces. This ensures that each Toyota component is made to the strict quality control standard in the business. It is recommended in order to ensure maximum trade-in value and ascertain the optimum performance for your machinery, it is essential to maintain your forklift with Toyota Genuine Parts. Toyota's Industrial Equipment has gained a great reputation for its parts availability and overall quality that has helped to ensure repeat business. Each and every dealer offers a complete inventory of Toyota Genuine Parts in order to provide you with an instant service. Don't hesitate to call your local Toyota dealer if you need any components replaced or any questions answered. All lift trucks built by Toyota has been done with Toyota's Genuine Parts and Accessories. Recommendations insist that Toyota machine replacement parts that are ideally should be switched out with a licensed Toyota Genuine Part. This is done to guarantee utmost levels of safety and quality are maintained. Toyota components have built a reputation for their strength and high level of excellence. These are amongst the reasons we have earned such a successful reputation in the industry and have developed such a positive level of customer rapport through the years.